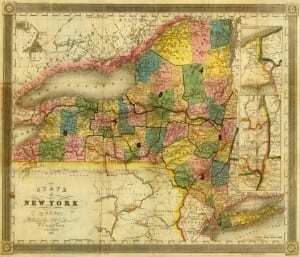 A September post on this New York History Blog had some examples of “putting history to work” – showing the value of history for revealing historical precedents, insights or parallels which help shed light on current issues. Demonstrating that value in varied, imaginative ways is an important strategy for building support and securing resources for our history progams. The U.S. Coast Guard is reviewing a proposal from a consortium of oil and shipping companies to establish “anchorages” along the Hudson River to store barges carrying crude oil south from Albany. USCG has the responsibility to review and approve, modify, or reject the proposal. It has received more than 10,000 comments from concerned citizens, local governments, environmental organizations, etc. But a number of historical organizations have also sent letters to the Coast Guard, including the Historical Society of Sleepy Hollow and Tarrytown, Hastings Historical Society, and others. For the most part, the historical groups recall the situation decades ago when the Hudson was polluted by runoff from industrial plants and the history of the long campaign to clean up the river. Now that that campaign has largely succeeded, the groups mostly oppose the oil barge proposal, citing the need to preserve the Hudson’s historic, scenic and cultural value. How will New York’s Senator Charles Schumer handle his responsibilities as the new Senate minority leader? One way of predicting that is to review Schumer’s 18-year record in the Senate and his 2007 book, Positively American. Another way is to review the records of other strong U.S. Senators from New York, for instance, Daniel P. Moynihan (independence, priority for environmental and tax issues), Herbert Lehman (standing up to the bully Joseph McCarthy), Robert F. Wagner (progressive policies, sponsorship of key New Deal legislation), Elihu Root (international peace and getting business support for government regulatory policies) and William H. Seward (opposition to slavery, Secretary of State and informal advisor to president Abraham Lincoln). On December 8, Governor Cuomo announced the awarding of more than $700 million in state regional economic development grants. Many were for street, water, sewer and industrial development projects. Some were for rehabilitation of structures in urban areas, including some historic building restoration, or for strategic community revitalization planning, which will involve historical organizations. But a few were more directly about history, demonstrating the importance of history to civic awareness, sustainable neighborhoods, community culture, heritage tourism, and economic vitality. *CAPITAL REGION: City of Cohoes Erie Canal Bicentennial celebration; Hudson Development Corporation, Hudson History Project self-guided tours; Shaker Museum initiative to explore Shaker ideas and influence; Thomas Cole Historic House, painting restoration and fire suppression system. *FINGER LAKES: Repair of historic windows at George Eastman Museum (Rochester); “Vote Tilla,” a weeklong navigational celebration of New York’s Suffrage Centennial along the Cayuga-Seneca and Erie Canals in July, 2017; Rochester Museum Science Center commemoration of the 200th anniversary of the Erie Canal. *MOHAWK VALLEY: City of Little Falls marketing campaign to exploit the city’s “rich cultural and historical heritage of life along the Erie Canal;” Arkell Museum (Canajoharie), to hire a Curator of Education and Public Engagement to highlight the Museum’s collection of American art and Mohawk Valley history; Rome Area Chamber of Commerce, Erie Canal Bicentennial celebration. *NEW YORK CITY: American Museum of Natural History, new facility; Staten Island Museum, capital improvements. The Minnesota Historical Society is seeking funds from the state legislature in 2017 to renovate one of its properties, Fort Snelling. In the History Matters — Take Action section of its website, it urges people to contact the legislature to express support. But the site’s “Many Stories: What Fort Snelling Means to Me” feature is particularly interesting. In short video clips, people explain what Fort Snelling means to them in personal terms. Correction needed: Cayuga-Seneca Canal not Seneca-Cayuga.